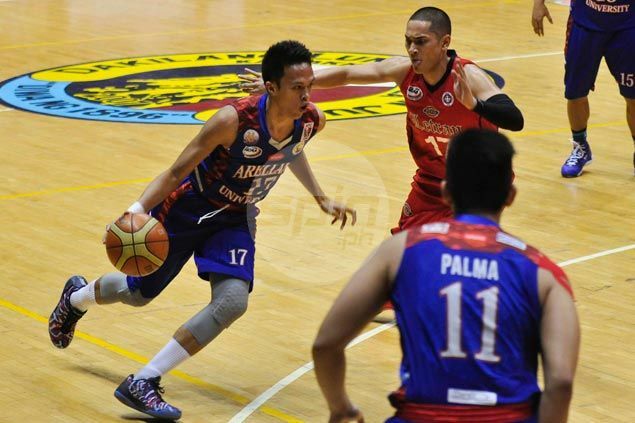 A SLOW-STARTING Arellano recovered in time to turn back undermanned Letran, 79-70 on Wednesday and secure at least a playoff for a Final Four berth in the NCAA men’s basketball tournament at The Arena in San Juan. The Chiefs fell in a huge hole early in the game, but climbed out in the nick of time to frustrate the Knights and eliminate them from semifinal contention for the first time since 2010. Keith Agovida topscored with 19 points, but Nard Pinto sparked the comeback by scoring 10 of his 12 points in the third quarter for the Chiefs, who notched a 12th victory in 16 games, while dealing the Knights their ninth loss in 15 games. Letran played without injured star forward Kevin Racal, while Knights coach Caloy Garcia was ejected for the second time this season, getting thrown out after picking up a second technical foul for continuous complaining with only 34 seconds remaining. Despite missing the services of Racal, who’s ruled out for the rest of the season due to an ACL (anterior cruciate ligament) injury, the Knights banked on a hot start as they established a 12-point first-quarter lead, but cooled off from thereon as the Chiefs turned the tables. Agovida scattered nine of his output in the second quarter, where the Chiefs cut the deficit to just seven, before Pinto took over in the third canto, where they leveled the count. “He really has that take-charge attitude,” Codiñera said of Pinto, the pride of Davao. The Chiefs turned the game around in the payoff period, outscoring the Knights, 21-12.